Have you been thinking about implementing a mobile first design in your marketing strategy, but wonder if this is the best place to put your marketing resources? Today, a mobile first design isnt an option. Its a necessity. It is estimated that by 2019, just a little more than a year away, mobile advertising will represent 72% of advertising dollars spent. Now is the time to develop your mobile content marketing strategy. Here are our tips to help you do it. What works for desktop digital marketing doesnt necessarily translate to mobile conversion. Do you know how to adapt your content marketing to the mobile audience? Identify what your mobile customer needs. When a customer pulls up search, they are looking for specific information like location, hours or pricing. Making this type of information easy for the mobile customer to find will up conversion rates. Short is good. Mobile customers are accessing content on a small screen. Anything that requires excessive scrolling is going to lose the customers interest. Choose short bits of content that will keep the mobile user engaged. The driving force behind mobile search intent is something called micro-moments, a buzzword coined by Google to indicate the brief moments when a mobile search intent is most likely to result in a conversion. There are three main moments, and when they happen, you have but a few seconds to capture the attention of your audience. What value you are supplying to your audience during these micro-moments? Value and easy access to information are the two factors that will drive conversion. Local searches on mobile devices lead to conversions. 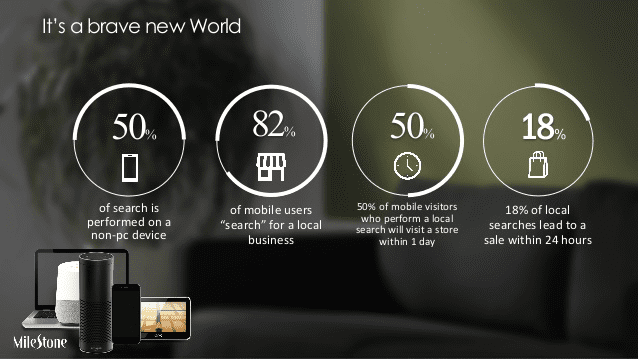 With local searches comes a greater sense of urgency with mobile users. Mobile SEO strategy needs to include hot keywords that customers are searching for when they want to land at your door, even more so than desktop searches. Mobile users also need to be able to easily find details about hours and location. From short clips, previews and live events, video is all the marketing rage. Not only do you need to be incorporating video, you need to tailor it to the mobile platform. Keep it short. Mobile users arent willing to devote as much time to video as desktop viewers. Keep it formatted. Square formatting is not only more visually appealing on a mobile platform, it also takes up more space in news feeds, making your content really stand out. Keep the eyestrain to a minimum. While everything is smaller on mobile, the one thing that should be larger is text. If your video contains text, make sure that it is large enough to easily be seen from 6-12 inches away. To be a successful brand, you need a strong mobile first strategy. There is no better time to develop one than today. Contact us, and the experts at JLB Works will help show you the way.